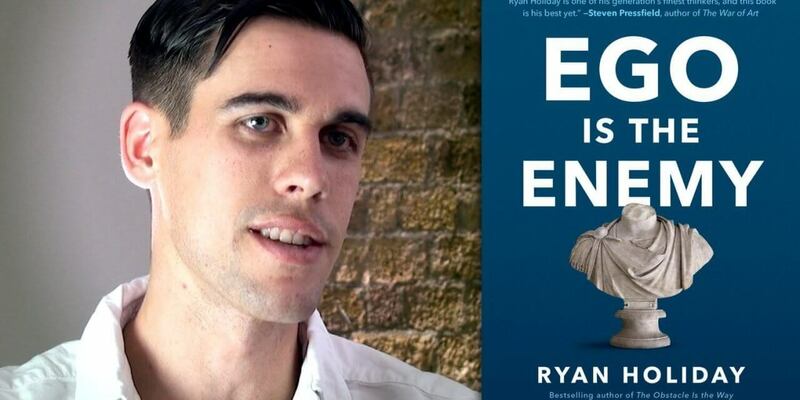 As you can tell from its in-your-face title, Ryan Holiday’s new book, Ego is the Enemy, has a bone to pick with you. Or at least it invites you to pick a bone with certain parts of yourself: the parts which tell you stories about how amazing you are, or cause you to show off to those around you, or which are unable to take criticism and instead react with childish petulance at the slightest provocation. 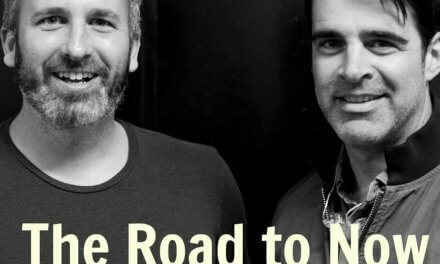 Building on the success of his previous book, The Obstacle is the Way, Ryan’s new book is a powerful call to take a step back from our selves in order to reflect, assess and, ultimately, grow. Ryan uses ‘ego’ in the everyday sense we all know: Whenever confidence slips into arrogance, or self-belief becomes blind. Or, more simply still, whenever you believe yourself to be the centre of the universe – that your feelings and needs must be taken care of ahead of anyone else’s. We can all think of bosses, bullies and bores who fit these descriptions (sometimes they’re one and the same person), but we all at times fall under the sway of the stories our ego wants to tell us. Any time you’ve ever said or thought the words, ‘How dare you do/say this to me!’, that was your ego talking. The voice of an inflated yet fragile self raging against treatment which it considers itself too special to be subjected to. Of course you’re special to yourself, but that doesn’t mean you automatically are to anyone else. Only young children – the ultimate egomaniacs – or Kanye West think that way. But then I started to wonder how and if the lessons of Ryan’s book translate for those of us who suffer from crippling self doubt, depression, or anxiety. When he writes that ‘Studious self-assessment is the antidote’ to egotism, what does this mean for someone who spends hours every day brutally ‘assessing’ themselves and finding themselves wanting? Is depression, in short, the opposite of ego, or even an ally in the battle against it? Merciless self-assessment is certainly one of the behavioural traits which depressives frequently cite as an advantage, even a blessing, of the condition: it gives a powerful sense of ‘seeing things more clearly’ than other people do, and of not falling prey to their inflated self-confidence. Often, a depressed person can feel an exquisitely painful sense of satisfaction when they see someone else’s ego getting out of control, because ‘I would never do that; I keep myself in check and know what my limits are’. In reality, however, this is a kind of internal Stockholm Syndrome: falling in love with your emotional jailer because it offers you a scrap of superiority even while it boots you repeatedly in the stomach. It’s like starving yourself to death and trying to feel better about it by thinking of how uncomfortable someone else’s indigestion must be after they’ve been to a banquet. No, things are more complex than they seem. If Ego is the Enemy focuses on the need to tame an outsize ego, the complementary piece of the puzzle is to recognise the egotism which, paradoxically, lies behind the depressed person’s endless self-battery. They aren’t opposites at all, but two sides of the same coin: depression is not ego-as-enormously-inflated-self-worth, but ego-as-enormously-deflated-self-worth. If egomaniacs filter everything through their sense of self-importance, depressives filter everything through their sense of inadequacy. The outcomes may be profoundly different, but the act of funnelling through a single filter – of making every interaction say something about, or be somehow defined by, me – is surprisingly similar in both cases. Whether egotistical or depressive, the internal narrative is the same: It’s all about me. Ryan writes about the dangers of creating and repeating narratives after you achieve any kind of success that make it appear as though it was all inevitable. Depression, in turn, constantly churns out narratives which claim that every failure you have was likewise inevitable. Both stories don’t reflect reality and both seriously warp your perception of self and your ability to function, achieve things, or to have have realistic perceptions of the future. That these positions are intimately connected becomes obvious when, as it so often does, depression spills over into self-pity – the ugly, attention-seeking behaviours which repel others and erode sympathy as surely as the self-promoting, hyper-confident egotist. Both demand attention with plaintive insistence and both are intrinsically toxic. Artists, great and otherwise, often walk this tightrope, slipping repeatedly off one side and then the other, because their self-worth is so entwined with the reception of their works. Consider a Morrissey or an Ernest Hemingway. Lurching between wild hubris and utter despair, scrabbling to meld the two toxic narratives together by telling a story about how suffering and despair is ennobling – internal Stockholm Syndrome all over again. What’s going on here? Why do so many of us let an internal narrator, indulgent or cruel, take control of our emotions? As Ryan explains, psychologists have identified a tendency in adolescents to suffer from a phenomenon known as the ‘imaginary audience’: the powerful and troubling sense that our every move is being watched and picked over by other – usually mean-spirited –people. 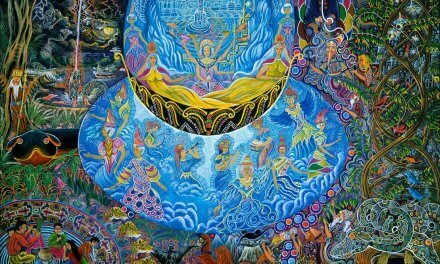 This is a fantasy which places us bang in the centre of other people’s attention, even if that attention is negative. It’s still, therefore, a question of ego… and it’s something which many of us never truly grow out of. A Russian saying aimed at keeping ego in check comes in handy here: Komu ty nuzhen? (Or, if you’re female, Komu ty nuzhna?) Literally this translates as ‘who needs you?’, but this pointed question means something more like, ‘why do you think you’re so damn important that anyone gives a crap what you’re doing?’. Can’t take the rubbish out without putting on make-up? Komu ty nuzhen? Can’t hit the dancefloor with your friends because you think you’ll look silly? Komu ty nuzhna? Or, as a dear friend of mine still more eloquently puts it: ‘Dude, get over yourself’. That’s all well and good, but for a depressed person, ‘get over yourself’ is more likely to send them spiralling into despair than to give them a bracing splash of cold water in the face. Unlike the egotist, being brought down a peg isn’t what’s needed here, so can we find another way to tackle the problem? Let’s take the example of creating something and sending it out into the world: a project, a song, an idea of some kind. When we make something, we tend to pour a lot of ourselves into it, and this often invites a crisis of ego if it’s not well-received by our audience, or a disproportionate inflation of ego if it is. For the depressed person, this is even more pronounced: rejection of the creation feels like rejection of me; and while acceptance of the creation can feel powerfully rewarding at a deeply personal level, this is actually just as dangerous: your self-esteem is placed firmly in the hands of others. As the seventeenth-century philosopher (a latterday Machiavelli and a major influence on Robert Greene’s 48 Laws of Power) Baltasar Gracián put it, ‘An image is made sacred not by its creator but by its worshipper’. Where, then, does that leave the creator and their sense of self-worth? Does this mean you must simply put the power in other people’s hands and make yourself the slave to public opinion? Not quite. Not if you can quieten the ego and distance yourself from the need for your creative work to be highly valued. It does not have to be venerated as ‘sacred’ to be a success in your own eyes; for your own internal stability, it doesn’t need to be valued by the outside world at all. This is the hidden meaning in Gracián’s words: they are a warning against leaning upon the praise of others; rather, if they praise you, people ultimately fall under your power and influence: your works, your views and perhaps even your person are now things they will pay attention to and value, giving you enormous influence. In this sense, they are dependent on you, not the other way around. This is not about your self-worth and personal wellbeing at all, but a relationship of power. All the same, how do we know if something we create is any good? Here, the question has to be: does it fulfil in our own eyes that which we set out to accomplish? In a recent interview with Aubrey Marcus, Ryan noted that how he feels about his books on the day he sends them out into the world should really remain consistent regardless of how they’re received and how many copies they sell. This is one of the hardest things any creator can do because it involves pitfalls on both sides: If you’re so confident in the value of your work that you insulate yourself against all critical feedback – even the constructive kind – then you are trapped inside an echo chamber along with an ego enflamed by the anger that comes from a sense of rejection or of not being ‘understood’. It is almost impossible to improve and develop yourself or your work in such circumstances. On the other side, if you leave yourself entirely at the mercy of outside perception, not only will your confidence in your work easily be crushed by criticism, but your sense of self-worth will be damaged too: if in the first case ego builds an impenetrable wall around you, here it binds you – your sense of self – to your work so tightly that if the book, project, idea or whatever else it may be sinks without a trace, you are sucked beneath the waves along with it. Obviously, we need to find a balance here, a quiet confidence which is underwritten not by self-importance, but careful preparation, learning, and purpose. This is the calm self-assurance of the alpha male or wise elder: they don’t shout, because they don’t need to. They are not embarrassed if they trip on a loose paving stone, because their self-worth is not fragile enough to be disturbed by something so minor. In this balanced state, pleasure and fulfilment can be drawn from having created something and shared it, neither inflated by the trappings of fame and fanfare that might accompany it, nor crushed by the backlash of criticism or rejection it could receive. Think of it this way. Being told you’re a terrible chess player only matters if your ego gets involved. If you’ve never played chess, you would shrug and think nothing of such a comment. If you’re a grandmaster, you would shrug and think much the same. It’s only when we hear criticism of things we’re already insecure about that the calm is shattered. We all have insecurities, of course, and few of us are grandmasters, so what can we do to minimise the damage they cause when tossed into the slathering jaws of the ego? One simple yet powerful solution is to be secure in our status as a student – to accept that we’re always learning and never perfect, and that this is absolutely and always a good thing. The virtue of always learning is the pulse which animates Ego is the Enemy and is also the key theme of Robert Greene’s (Ryan’s mentor’s) book Mastery. Even if we achieve a level of ‘mastery’ in one area, education is something ‘ongoing and endless’, as Ryan emphasises. And that is where the joy of it lies, too: ego – inflated or depressed – means being stuck in place, fixed to a rigid interpretation of how things are, forcing everything through a single filter. Learning is the opposite; learning is our ally. So where does this leave us? ‘Studious self-assessment’ is indeed the key, but it must be done with love and compassion. Just as criticism of others rarely makes an impact when wielded as a blunt instrument, beating yourself up is not the same as reflecting constructively on how you might improve in certain areas. Ego may be the enemy, but depression is its running-mate. These are fine principles. But particularly for those of us who suffer from depression, I would add one further item: we should aspire to be Kind in our self-assessment. 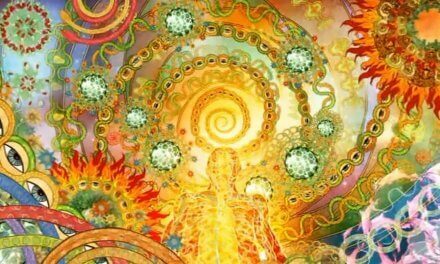 Ego might be the enemy, but this isn’t a fight to the death; this is a fight for a higher quality of life. Ryan Holiday: Ego is the Enemy and The Obstacle is the Way. Robert Greene: The 48 Laws of Power and Mastery.